The Pulitzer Prize–nominated author of Forrest Gump examines Confederate general John Bell Hood's fateful maneuvers in the final moments of the Civil War. 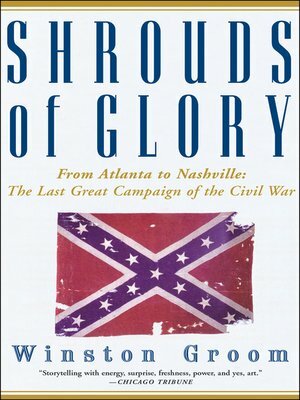 In Shrouds of Glory, acclaimed novelist and historian Winston Groom introduces readers to the courageous but reckless Hood, prematurely thrust into the spotlight by a combination of destiny and fate. Witness the unlikely rise of this young Confederate, who graduated forty-fourth out of a class of fifty-two at West Point, as he overcomes the nearly fatal amputation of his shattered leg and eventually devises a strategy to turn the tide of the war. Weaving together eyewitness accounts, journal entries, military communiqués, and newspaper headlines, Groom recreates the war from the charged battlefields to the general's tent where Grant, Sherman, Lee, and others plotted their unorthodox strategies. He paints vivid portraits of the major players in the conflict, revealing the character, the faults, the emotions, and most of all the doubts that molded the course of the war.